Most of the time its mainly the planted tanks that get highlighted in journals and write-ups... but the humble tank cabinet rarely gets much attention, especially on ideas and ways to maximize space usage. Perhaps its time to have a look inside them too. Most of the equipment i have are quite standard in most cabinet setups... ie. canister filter, Co2 tank system, in-line reactor, water top-up flask, maintenance tools, power strip, timers etc. Along the way, i managed to allocate enough space to place a small 10 Liter nano tank (L20cm x W20cm x H25cm) with its own hang-on filter and clip-on LED lights in the cabinet. It's a narrow fit, but with abit of arrangement, there is still sufficient clearance to allow easy access to the other equipment. Due to the limited floor space in the cabinet, i had to look into vertical storage methods to keep the rest of the items. A simple solution was found by just using a combination of mesh grate and mesh baskets from Daiso. The whole vertical structure on the left side is modular and held up by heavy duty 3M command hooks. Good work on the layout, I like the hanging rack. Currently I just 'dump' all my equipment(siphon, chemicals) in the utilities shelf outside my door. Super meticulous arrangement! One question - How's your experience with the CO2 system that you have? 1. How long do you have to turn it on daily? 2. How long does 2L CO2 cylinder last? My Co2 system operates for the same duration as the light photo-period (ie. around 8 hours), its solenoid regulator is linked to a digital plug timer and scheduled to automatically switch on 30 minutes before the lights come on and switch off 30 minutes before the lights go off. Based on 1 bubble per second (bps) injection rate running 8 hours a day, my 2L Co2 tank can last for around 11-12 months before it needs to be refilled. Where did you buy your cabinet? Would you mind telling how much a cabinet / stand like this cost you ? This cabinet cost me around S$215 to custom make. I am very impressed with all of your tank set up and really eager to set up my very first one, too. I would like to check if the cost of S$215 above includes cabinet + tank or just the cabinet itself? And normally where do you get the crystal tank from? Can it be customized, too? S$215 is just the cost of the custom made cabinet... the 2ft crystal glass tank was purchased separately from Seaview Aquarium at around S$60+. A few questions on 'what’s inside your incredibly clean and organized cabinet’. 1. Does a CO2 system make a difference for a small planted nano tank ? Can it be substituted for something like Seachem flourish excel. If no then could you recommend a CO2 system and what to look for when buying one? As of now I’m using flourish excel and the plants are growing fine but don’t look nice and green like yours. Also, I'm not sure if its BBA on the hairgrass that I have but the first bunch that I planted all seem to be like they are burnt out. Blackish strands of grass. 2. You have all your solutions (Excel and a few others that i can’t read) in nice white bottles on the top left. Where did you get those bottles from? 3. Your timers are all digital. The one I have for my lights has these small buttons on the side and I can’t figure out how to set the time on that. Where do you buy your timers from ? And how expensive are they? 4. The outlet of your canister filter is connected to something that is clipped to the side of the cabinet. What exactly is that? 1. Co2 injection systems are definitely beneficial for plant growth in nano tanks... carbon is an essential component for plant photosynthesis and growth. You can use Seachem Excel as a liquid carbon alternative, it does help but the overall effectiveness in promoting plant growth would still be less than actual Co2 injection. Do keep a look out for special promotions on that Co2 system popping up now and then, i got mine for around S$184+. 3. Sounds like the ones you have are the analog ones, they can work too, but require manual setting and the main power to be constantly on or else you always have to keep adjusting the time. The digital timers i got are from the brand called SoundTech and i bought them during a promotional sale at a neighborhood hardware shop, worked out to around $15+ each. They work very well (can program for individual days of the week and down to the minute) and each unit has an inbuilt auto-rechargeable battery which remembers the time and timer schedules even when the main power is off. 4. That is the ISTA Co2 reactor... Co2 is injected into it and its reactor chamber has spinning rotors (powered by the filter's flow) which chop up and mix the Co2, this enables the Co2 to be 100% dissolved into the water before it exits into the tank, hence greatly improving Co2 efficiency and distribution. Hi there, I have this same type of CO2 reactor too and connecting it to Eheim 2222 for my 2ft tank. However, of the 2 propellers, only the bottom one is spinning, the top one is not really turning much. Tried cleaning up my 2222 as suspect flow rate is low but still the same. Checked both propellers able to turn freely. Does yours turn well? I am afraid that the flow rate is affecting the CO2 dissolving rate, going to get new checker drop to confirm. Thanks for your knowledge sharing. Ideally both rotors should be spinning very fast and mixing the Co2... sounds like the top rotor in your particular unit is either stuck or the plastic molding/fitment is somehow abit too tight for it to spin freely. Open up the casing and remove the rotors, try to trim the top rotor until it sits loosely on the pipe, it should spin freely even with the slightest flow movement. The Eheim 2222 flow rate at 500 l/ph is on the lower side of flow speed required to power the reactor, but it should still be able to work. That being said, a higher flow rate filter does help to spin the rotors much faster and increase the mixing efficiency, so thats something to consider if you plan to upgrade your canister filter in the future. By using CO2 reactor, basically you do not need to use the CO2 diffusers anymore right? Yes, Co2 reactors work to mix all the Co2 gas into the water completely to achieve 100% dissolve rate, its one of the most efficient methods... so no need to use conventional Co2 diffusers. How do you have such clean pipes ? the inflow and outflow pipes i have have become dark brown in color. so have my lily pipes. Do you clean pipes often ? I've had mine running for about 3 months. Hey UA, how many hooks did you use to hold up the mesh grate? Do you remember how much weight per hook holds? I could only find 225g/450g type hooks from Comand, and frankly they look fairly flimsy. To hold up the mesh grate, i use 2 pieces of the 3M Command "Medium" hooks which can hold 1.3kg each... so that works out to around 2.6kg in total weight capacity, which is sufficient for my usage. I've also seen the "Large" hook version which can hold up to 2.2kg each, so those would be suitable if you plan to mount heavier items on the mesh grate structure. You can buy the 3M Command hooks from most local hardware stores (ie. HomeFix). 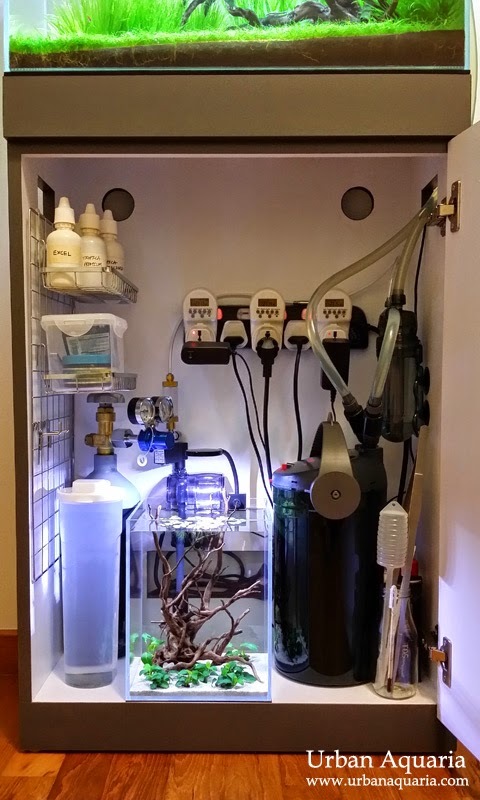 Yes, the Eheim Ecco Pro 300 is ideal for my 2ft tank setup as i prefer higher flow and circulation around my tank. With the inline Co2 reactor installed, it does reduce the overall flow rate slightly, but the higher flow rate of the filter compensates for it. For canister filters, go for the ones with the most space for holding filtration media. Look for filter models with flow rates that are around 8-10x the tank volume. Higher flow rates would be preferable if you also intend to install inline equipment like chillers or Co2 reactors, as they will contribute to slowing down flow too. Thanks a lot for your tip. I am about to set up my tank from scratch and I am really inspired by reading your blogs. :) Cheers!